Jeffersonville’s major retail corridor and thoroughfare is 10th Street. From Spring Street near Interstate 65 to the interchange at I-265, the local 10th Street merchants serve Jeffersonville and our entire region. Many work together as members of the 10th Street Area Business Association. Each year, the 10th Street Area Business Association sponsors the 10th Street Business Expo, an event that showcases 10th Street area businesses. “Part of our focus is to give support and help make those businesses successful by letting the community know that they’re there,” Strong said. The City of Jeffersonville has a plan to improve 10th Street that addresses the growing needs of our city. 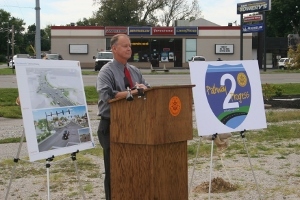 Mayor Mike Moore unveiled the details at a press conference that include widening the street and adding turn lanes to improve traffic flow. New lighting and landscaping will encourage a twenty-first century shopper and pedestrian-friendly 10th Street. “One of the things that’s changed on 10th Street is the city government and the amount of attention that’s being paid to it by the city government. Especially this current one has really made the improvement of 10th street a priority,” Strong said. 10th Street is open for business and growing! The merchants of 10th Street cordially invite you come to 10th Street and take care of your business by shopping local!